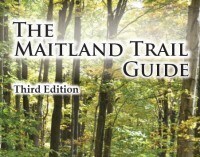 Our Trail Guide provides 1:15,000 topographic maps and written descriptions of all the trails we maintain. These will help you confirm your location on the trail and prepare you for general trail conditions. Side trails may be offered as alternate routes. Many interesting features are noted to spice up the text with entertaining and educational insights. 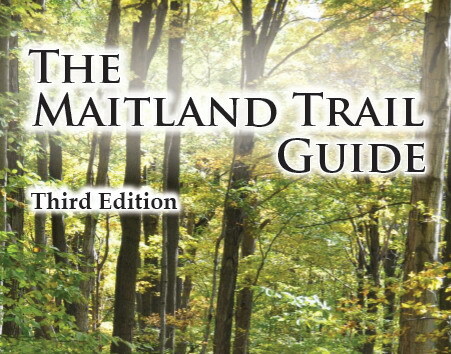 Our 3rd edition Trial Guide is now available to purchase. Navigating the trails is relatively easy if you follow the system of blazes – painted symbols that mark the trail. They’re painted on trees, posts, concrete or steel structures, and are generally about 5-6 feet off the ground. They may also be found on a rock, a short post, or on the road where there is no alternative. 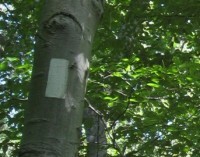 The main MTA trail is marked with white blazes, with secondary trails in blue or yellow. One vertical blaze indicates you’re on the trail. Two vertical blazes offset indicates a turn, either left or right – read these from the bottom to top to determine the direction of the turn. Verify that the turn is correct by confirming the next vertical blaze. One horizontal blaze above a vertical blaze indicates you’ve reached the end of the trail. Our trails often cross other, unmaintained and/or private trails that are not intended for public use. These other trails are not on our maps and are not blazed. Please stay safe, and respect the landowners by staying on the designated trails. Hike only along marked routes. Don’t take shortcuts. Respect the rights and privacy of landowners and people living near the trail. Don’t climb fences; use the gates provided and close them behind you. Leave the trail cleaner than you found it; carry out litter. Fires are not permitted along the trail. The only exception is within Falls Reserve Conservation Area, at designated campsites. Leave flowers, plants and animals undisturbed for others to enjoy. Keep dogs on a leash, especially on or near farmland and roadways. Be responsible for the well-being of yourself and your company. All of our trails are used at your own risk. Conditions change with the weather; they can become slippery when wet, especially un-shingled wood structures covered with fallen leaves, and wet earth slopes. There may also be broken boards on bridges and boardwalks, uncleared windfalls and tripping hazards from tree roots, etc. Please let MTA know if you encounter any hazards on the trail. Being prepared can make the difference between a happy or a miserable experience. Accidents are more likely to happen when you’re thirsty, hungry, cold, hot or tired. Be prepared and make good decisions. Avoid hiking alone. But if you do, let someone know where you’re going and when you’ll be back. Dress appropriately for the terrain and weather – sturdy footwear, extra layers, rain gear, a hat. Sunglasses, sunscreen, insect repellent or head-net. Water and snacks. Some people need a lot of water, some less. Know your needs before you set out. A cell phone. You may need to get to a height of land to get service. Some basic first aid equipment: bandaids, disinfectant, after-bite. Be familiar with poison oak, poison ivy and poison sumac. Carry pictures with you (printed, or on your phone). When in doubt, don’t touch. Follow your location on the map, pay attention to the blazes and other landmarks such as Km markers and road signs. 911 numbers and road names are given on the maps. They are reliable landmarks in case of emergency.